I really don't think I need to go into detail about the flight, but just to REALLY paint a vivid picture, I'll just ask if you've ever held a feral cat who's just consumed a Venti-sized triple espresso on your lap for 90 minutes? A cat who can scream loudly? Like, LOUDLY? Because then you would know. 1.) Bask in your 5-year-old's complete and utter amazement at being able to brush her teeth before bed using WATER FROM THE TAP! Poor Kaia stood in the bathroom for over five minutes, waiting for me to bring her a cup of purified water in which to dip and rinse her toothbrush. When I explained that no, no- you can drink the water from the sink here, her response was? "Wow!" 2.) Confound your children by actually WALKING as a means of transportation, rather than driving 30 minutes just to get anywhere. We took the kids to a few parks, just to walk around, and Kaia kept looking around and asking, "But where are we GOING? Why are we walking? ", followed by the inevitable, "I'm tired of walking!" about 10 minutes into our stroll. Please understand that this is not the result of bad or negligent parenting, but rather of having spent the past 4 years living in places that are as opposite of pedestrian-friendly as you can possibly get. Sometimes we get the kids out to walk around our compound, but we are usually chased back inside by the swarms of Possibly-Dengue-Carrying mosquitoes that love to envelope us as soon as we walk out the front door. 3.) Walk past a candy store that has a front display of Marshmallow Peeps. Marshmallow Peeps! Buy one, get TWO free! Decide not to buy any. Seriously? Seriously. Get home and spend first few nights back wishing that you had Marshmallow Peeps. Just one Peep. Sigh. 4.) Validate your decision to not have any more children, because if your friends' baby, who is quite possibly the cutest baby in the world, does not make your ovaries tingle, then nothing will. Bring on the vasectomy! 5.) Be grateful that your husband has finally seemed to accept- nay, EMBRACE- your food-hoarding tendencies by allowing you to go to the grocery store to stock up on things that cannot be found at home without even ONE conversation that involves him saying, "But WHY do we need ten boxes of chocolate pudding to last us the rest of the semester?" or "Why can't we eat it until it's gone, enjoy it, and then be happy that we had it and move on?" You know what kind of talk that is? That is just crazy talk, that's what that is. 6.) Watch your daughter tremble with the anticipation of giving a street performer some money, because he is actually out there attempting to make a living with an obvious, hard-earned talent instead of forcing a chained monkey to ride a rocking horse while wearing a doll's mask. And if that is not the freakiest thing that I have ever written, then I just don't know what is. Can't wait to hear your next fabulous adventure!! Come again soon! It was great to see you. 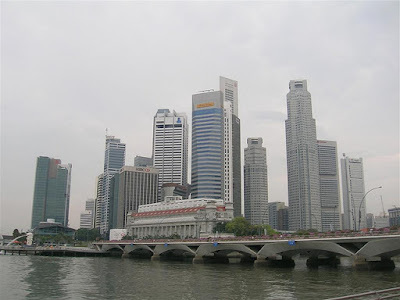 Very interesting take on kids visiting Singapore-enjoyed reading it!